The Web Client is divided into two parts: Toolbar and Directory Listing. 1.Toolbar contains the buttons to perform various utility functions. 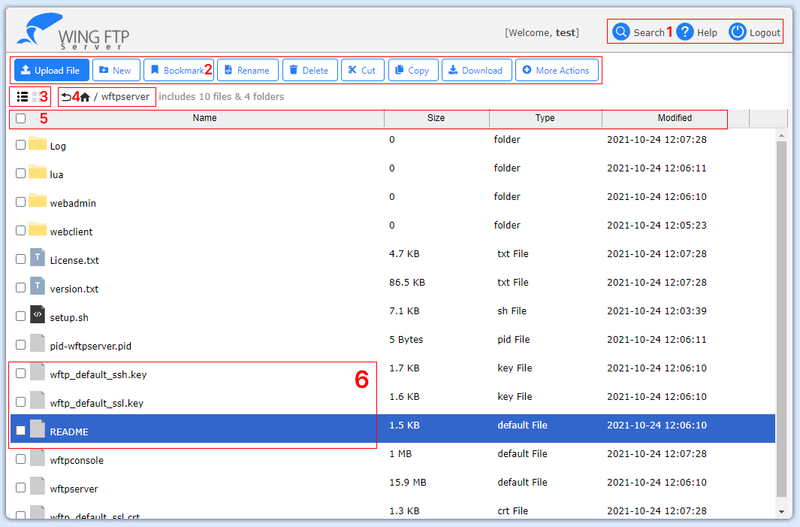 2.Directory Listing gives a list view or thumbnail view of files and directories. Change the current directory to the parent directory by clicking this button. For example, if your current directory is /home/document, clicking the button will change the current directory to /home. This button will bring you to the home directory directly. Refresh the current directory listing by clicking this button. Use this button to open an upload window from which you can browse your local machine for the file you want to upload, then click the "OK" button to start uploading. Click this button to download files that have been selected. Click this button and input the name for the new folder, then click the "OK" button. Click this button to delete the file or directory selected. You can search files recursively using exact filename matches or wildcard matches. This button only shows up when the current view is in list mode, click it to change to thumbnail view mode. This button only shows up when the current view is in thumbnail mode, click it to change to list view mode. Use this button to change the current directory to any directory you specified. Create a direct web link for file sharing, you can also set the limit number of download and expiration date. You can request files with just a link, you can also set the upload password or expiration date. Select a file or directory, click this button and enter the new name in the pop-up window, then click the "OK" button to complete. Click this button to cut file or directory selected. Click this button to paste the file or directory that was cut shortly. Click this button to open the online text editor to view or modify the text file that you have selected. Click this button to open the online help document for Wing FTP Server's Web Client. Click this button to change the password for the current user account. This button is only available when the administrator has enabled this feature. Click this button to safely terminate your web session.